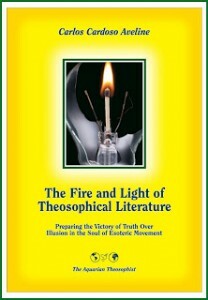 edition of “The Aquarian Theosophist”. H. P. Blavatsky is known among Theosophists as HPB. This has a meaning. The name of the body is one thing; the name of the Soul is another. When a child is born a Name is given to its form, and both these, name and form – Nama-rupa in Sanskrit – are but masques. In most cases the masque passes as the Real, the Soul; for, in most the Real Self or Atman, does not shine forth. Intuitive students know that the body which bore the name of Helena Petrovna Blavatsky was a masque; in that form a mighty Soul dwelt and toiled; that Soul loved humanity and labored for it. Her pupils, students, friends, felt the power behind and, not knowing how to distinguish that Great Soul from the Masque, called it HPB. The name of the soul is sacred; therefore it is kept secret – for It has power. All Great Initiates have Their True Mystery Names. Therefore once a Mahatma wrote, “the personality known as HPB to the world but otherwise to us”. Look at her picture and contemplate: look behind those penetrating and all-seeing eyes; observe those resolute closed lips which, if they would open, could tell the secrets of worlds unknown; that noble forehead, the shrine of the Ageless Wisdom of the great Lodge; that beautiful but strong hand – protector of humanity; the whole massive grandeur, symbolic of her mighty dynamic soul. Behind and beyond those symbols dwelt the Soul – the Greatest our age has known. HPB left no successor. All those who learn what she taught, practice what she preached, live true to the Message she delivered, and propagate those Teachings, are her true successors. Aspire strongly, each one of you, to become the true successor. But, beware of pride and egotism and desire to lead; shun the life of the flesh, seek the life of the Soul. As souls only can you become the pupils of HPB. To be successors of HPB in the true sense – that is the great destiny for you. What is the worth of money compared to the wealth of Wisdom? What is fame in the world compared to the inner soul-satisfaction of Sacrifice? Aspire ardently, work patiently, persevere till you come to know HPB. 1) Through joy and sorrow, pain and pleasure, the Soul comes to a knowledge of itself. 2) All the past shows us that difficulty is no excuse for dejection, much less for despair, else the world would have been without the many wonders of civilization. 3) Virtue and wisdom are sublime things, but if they create pride and a consciousness of separateness from the rest of humanity, they are only the snakes of self reappearing in a finer form. Through such Teachings we will attain as she attained. That Christ-like strength was born of loving deeds. That Buddha-like knowledge was born of patient search. That Krishna-like compassion was born of holy aspiration. The universal real HPB ought to be for all of us symbol of the Goal, the Comforter, the Lord, the Witness, the Resting Place, the Asylum and the Friend. Who was that Great Soul? None of us mortals can truly know and those who do will not reveal. Here is the greatest of Theosophic Mysteries. HPB left behind the token of her immortality – the flowers of noble deeds, the fruits of inspiring ideas. Her writings are like deep, deep mines – full of Kohinoors  fit for the crown of the Soul. Just as behind her photograph lies hidden the mystery of the true HPB, so within her words is concealed the mystery of her Message. You, young friends , can know the truth if you make yourselves worthy of relationship with her. Live wisely according to her teachings; love impersonally as she did, sacrifice all you have and all you are, as she gave to the Masters and the Lodge, and – you will know HPB, the Thinker of Eminence, the Compassionate Discriminator, the Lord over death itself.